Using a RODI system without a TDS meter is like driving a car without a speedometer and gas gauge. At some point you will end up in trouble. With RODI systems it is TDS that you will want to monitor for performance and filter quality. 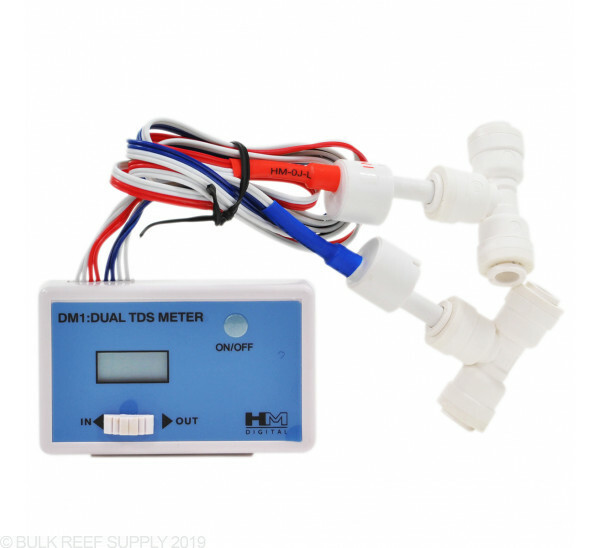 By using a dual TDS meter it will allow you to see your TDS readings in two places. 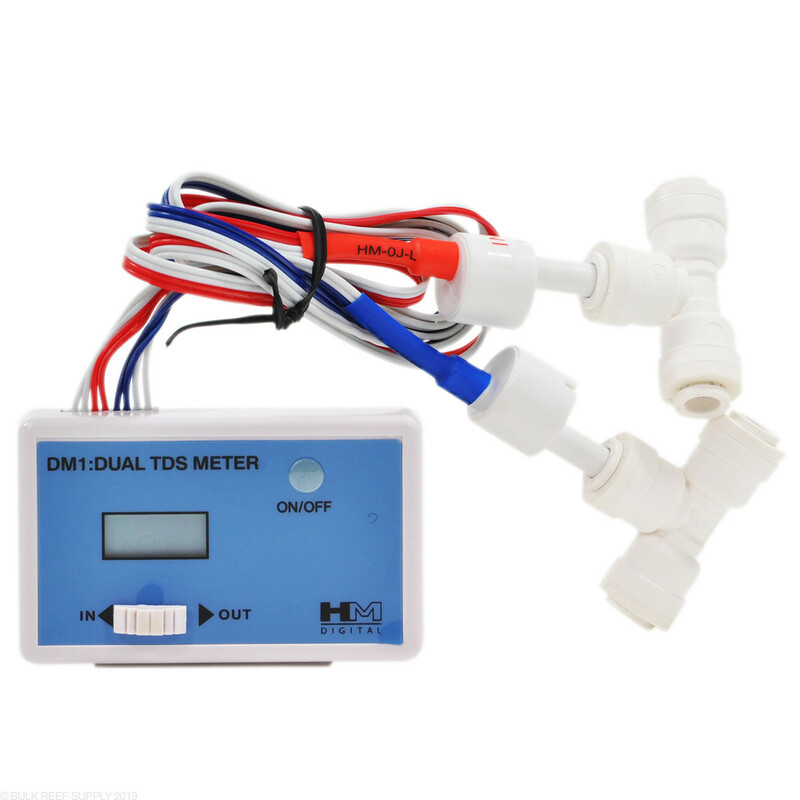 We will usually suggest putting one probe before the DI stage and one after the DI stage to show what your RO is producing for water quality and then how your DI is performing by removing all remaining TDS from the final product water. 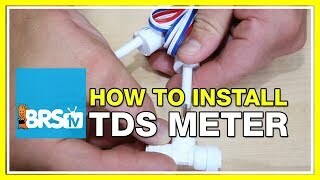 BRS suggests: installing the dual TDS meter post membrane and post DI stage. These two readings will notify you when it's time to change the RO membrane and DI resin. 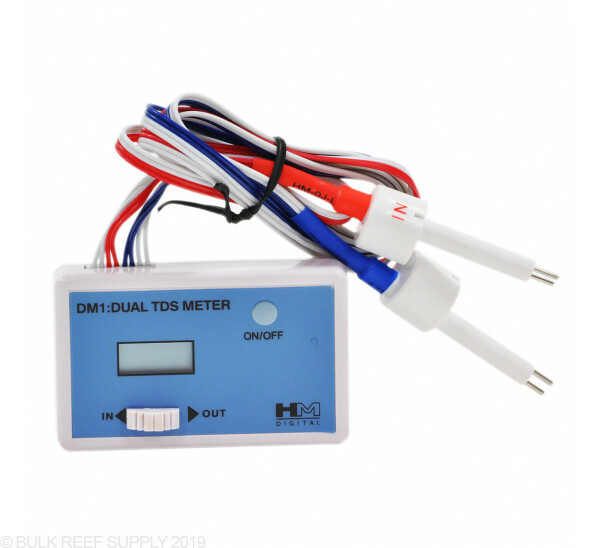 This unit features a digital display and comes with two 1/4" John Guest Quick Connect Tee's. As with all HM-Digital products, the DM-1 comes factory calibrated. So easy to install and use .cant believe iv went with out this for so long after having to use the pen meter this is great. My first TDS meter was purchased as part of my 5 stage RO/DI unit from BRS and lasted a good 5 years or so. When it finally died, I replaced the batteries and it displayed UUU on the display and nothing else. No matter what I did it would only display UUU and couldn't find any helpful info online to help me understand what was going on. I ordered a new dual inline TDS meter and we are up and running again. I can only hope this one lasts as long or longer then the last one. Would not run my system without it, lets me know the quality of my finished product with a touch of a button. Very simple and easy to install. Helps determine when filter media needs to be changed. This is the second dual unit I've purchased from BRS. Not because the first one broke, its still in operation and working well after a few years. I purchased a second unit so that I can monitor more points of my RODI system and of course I've added some more filtration going silly to protect my Reef from any number of contaminants. My local water company started to use chloramines on a here and there basis to ''burn'' the water and when this happens and my RODI unit is running It will get destroyed quickly. To combat this I've added three charcoal canisters inline before my Unit as a precaution. Some will not go this far but its worth the extra piece of mind for me and I test regularly with the Lammont strips so I know when the Pre charcoal canisters are exhausted and it saves my expensive chloramine charcoal filters in the unit. This added dual TDS meter will allow me to better see what is happening around the now 9 stage RODI system. Pure water is essential for my reef and after getting ''burned'' literally without checking my tank got hit hard with chloramines, This is how I found out my water company was using it on a sometimes basis. Now I'm better prepared for any change they decide to make even if a temporary change. The TDS meter did work great until the whole RO/DI unit tipped over and impacted right on the meter's "in-out" switch. Buying a new TDS meter today because the LCD displays jibberish characters now. I ordered RODI system with this meter- out of the box and a second meter failed to register. Works ok, but need to be careful to avoid damage. Seems to be accuarate. The unit is simple, accurate, easy to install and a must for your RODI system. I'm thinking about adding another Deionizer and wish I had bought the triple unit for a few dollars more, but still an excellent buy. Basically this will allow you to take the guessing game out of when to replace your RODI filters. This is super easy to install and easy to use. To be fair I have no way to tell if this is accurate since I am completely relying on the TDS meter on this unit. But I did use this right after I changed all my RODI filters and I had a TDS of 320 going in and a TDS of 1 coming out. I use a 4 stage/75gpd RODI unit. No more guessing when it's time to change filters, resin or membrane. Always trusted a local shop with a stick meter, that was a mistake I'll never make again. This meter is accurate and easy to install. Great price too. Wish I had ordered this a long time ago. This is the most accurate meter I have owned! Works as advertised. Good to know when you're producing quality water! Is the battery in this unit replaceable? It sure is. It uses a pair of button batteries that can be replaced fairly easily. How do I change the batteries on my TDS Meter? How low does the meter read? I need it to read <0.1 ppm TDS. These meters read from 0 ppm in increments of 1 ppm to 999 ppm. (9990 with calculation) This will not go be lower than 1 ppm measurements. Feel free to let us know if you have any further questions! 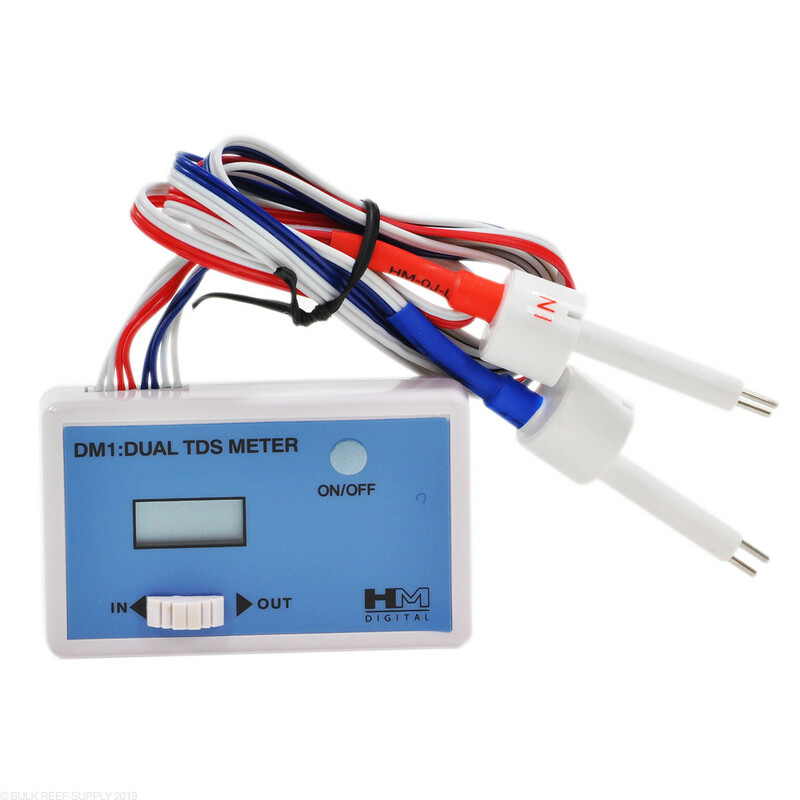 I have this dual meter installed in my 4 Stage R.O. as recommended I am noticing a substantially higher levels of TDS in my R.O. system lately. Maybe 5 times what they were originally a year and a half ago now approaching 100... These levels are reflect straight out of the tap as well and post filter change... I have not changed my Membrane but it is a 18 month old Dow and my water production requirements are not large so it shouldn't be a problem. My question is what is the best way to test ( Deionized Water) the meter and calibrate it if necessary? We don;t recommend calibrating the units as we have not found them to be out of calibration since we have been using them. The calibration steps would also need to occur in a laboratory environment. If your TDS coming out of the membrane is in the 100's there is most likely an issue with the membrane, which possibly needs to be replaced or a bacterial bloom in the housing. What kind of battery does this meter require? This TDS meter uses an LR44G Battery. Does the meter have to be replaced at some point? I noticed today that the filters are needing to be replaced but I'm getting an output reading of 0.0. 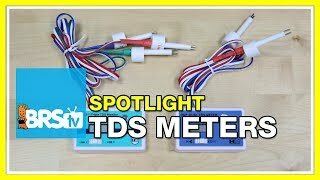 The TDS meters on the units do not need replacement. In many cases they will last the life of the unit. It very well be that CO2 or other elements are reducing the DI resin faster than any TDS. Feel free to let us know if you have any further questions!